STEPHEN SAXTY. There are scattered entries for names similar to Saxty in the Sandwich registers, but Stephen’s is the first family of that name for whom we have continuous records. Their oldest child was born in 1679, so this is probably the marriage between Stephen Sacksedy of Deal and Mary Adams of Sandwich on 18 Feb 1676/7. 1695 May 5 Stephen son of Stephen Saxy and Mary his wife. There are many variant spellings of his family surname: Sexsy, Saxe, Saxcy and Saxy are just a few. Elsewhere in the county we find a large concentration of Saxbys. He was 8 years old when a terrifying cyclone hit the south of England. It was the most violent storm ever recorded in this country. Well over a thousand seamen died as their ships were driven onto the Goodwin Sands opposite Sandwich. The whole of the Royal Navy’s Channel Squadron was wrecked. 700 ships were piled one upon the other in the Pool of London. In the New Forest, 4000 oaks were lost. Queen Anne had to shelter in the cellar of St James’s Palace as the chimneys and part of the roof collapsed. Stephen’s mother died when he was 18. We have no firm information about his occupation. There was a large family of Saxbys in Brenchley, near Tonbridge Wells, who favoured the name Stephen and were predominantly clothiers. In the 16th century, Canterbury saw a large influx of Walloons and Huguenots, who worked chiefly as weavers and associated tradesfolk. Among them was the De La Saux family, Anglicised as Six. We do not know whether the Sandwich Saxe/Saxtys were related to these, but it suggests that Stephen may have worked in the cloth trade. Alternatively, the Walloons first settled in Sandwich, where they were mostly bargemen and gardeners. Since he died by drowning, Stephen may also have been a bargeman. Sandwich was one of the original five Cinque Ports. Since 1500 the River Stour it had been silting up, restricting access to the sea, but Queen Elizabeth I gave the town a further lease of life when she ordered the river to be dredged. It is now two miles inland. When Stephen was married in Sandwich in1724, he was entered in the register as ‘Stephen Saxby jnr’. This suggests, not only that he was the son of an older Stephen Saxby but that his father was still alive. ELIZABETH JORDAN. Elizabeth was the second of the six children of Thomas Jordan and Elizabeth Widdoway. She was born in 1703, in the second year of the reign of Queen Anne. Five days after her birth, the Great Storm of 1703 struck Sandwich. By the time her youngest sister was born, Elizabeth was ten. No doubt she helped her mother look after the younger children. She married in Sandwich in 1724, when she was 20. This was quite young by the standards of that time. The marriage was no doubt brought forward because Elizabeth was five months pregnant. Stephen, then aged 29, was probably the father of her child, but there is always an element of doubt. If, for instance, a girl was in the service of a well-to-do gentleman and made pregnant by him, or one of his sons, then he might pay a local man to marry her and bring up the child as his own. The Overseers of the Poor might make a similar arrangement to save the mother and child becoming a burden on the Poor Rate. Two years later there are two burials. This is followed by the birth of another child. A week later, there is another burial. Thomas’s baptism record does not say that he was a posthumous child, though this is not conclusive evidence. Stephen senior would probably have been in his 70s. On balance, it is more likely that Stephen junior died in the bay. Elizabeth was left a young widow with a toddler and a newborn baby. It is likely that she went back to live with her parents. If so, it was a short-lived arrangement. Less than two years later, both her parents were dead. 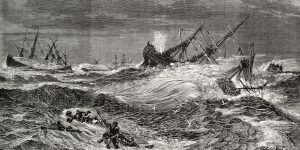 It is possible that her father died at sea, or shortly after being rescued, and was buried in nearby Deal. Her widowed mother was given a pauper’s grave. We have not found a burial for Elizabeth Saxty. She may have married again. 1735 Apr 14 Elizabeth d of Ralph Colson and Elizabeth. The baby lived less than four months. The baptisms appear to end there. We have found no burials for Ralph Coulson. There is a possible burial for Elizabeth in Birchington, 8 miles north of Sandwich, next to Margate. 1770 Oct 30 Elizabeth Coulson. There is only one other record for a Coulson in Birchington, and that is the marriage of a Sarah Coulson. Elizabeth Coulson appears to have come from another parish. If this is the former Elizabeth Saxty, née Jordan, then she was 67.